The mountain is named after William Mackenzie King who was a three-time prime minister of Canada 1921-26, 1926-30, and 1935-48. He was one of the first politicians to actively show an interest in industrial workers in Canada. 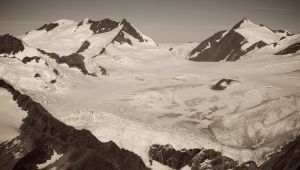 The mountain is located in the Premier Range of the Cariboo Mountains and is part of a divide that separates the Laurier Glacier to the north from the David Glacier to the south. At times, a spectacular arrow shaped cornice forms near its summit.